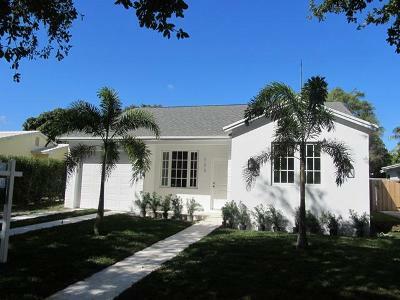 Fabulous brand new 3/2 with exquisite finishes and garage in the middle of the top neighborhood of West Palm Beach! Custom marble bathrooms, dual walk-in closets, marble custom kitchen, 10-14' ceilings, hurricane windows, laundry inside, everything brand new! Walk from your Beach House to new Warehouse District, Cityplace, Antique Row, Clematis St, much more! Shopping, theater, and restaurants all around, beautiful historic houses are your neighbors. Beach and Palm Beach shopping is an easy ride/walk. Everything inside the house is brand new, with impact glass and huge rooms and beautiful space. Rare opportunity for new finishes in historic neighborhood. You are going to LOVE this house!